Tiffins is a table service restaurant in Discovery Island at Disney's Animal Kingdom. It's a top quality meal. Located behind Pizzafari, Tiffins is named for a lunchbox used by travelers, according to Disney Imagineers. The restaurant reflects that theme, with a collection of decor styles and an internationally-inspired menu. Dishes include pan-seared duck breast and leg confit, Wagnu strip loin and braised short rib, and whole-fried sustainable fish. We had an amazing meal as part of the Rivers of Light dining package. 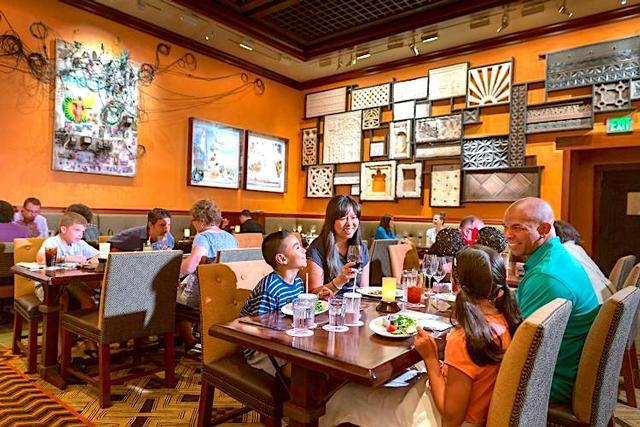 The package requires guests to select a 3-course pre-fixe meal from the standard list of menu items, but reserved seating for ROL is included without having to use a FP+ reservation. The only drawback is that guests dining on the Rivers of Light dining package must eat their meal at least 2.5 hours prior to the first show of the evening, so it's probably not good for those who prefer to eat dinner later in day. I had the grilled octopus appetizer, my wife had the charcuterie board, while my son had the tomato soup. The octopus was very tender and flavorful, while the charcuterie board was diverse and filling, and the soup was definitely fresh made that day as advertised. My son's entree was the grilled steak, which was brought out medium rare as requested (seeing that it was from the kids menu, I was shocked that this came out as ordered). I thoroughly enjoyed the duo of venison, which had some of the most tender loin I've ever eaten, and some delectable sausage along with it. My wife went with the Wagu, and she was not disappointed. Our desserts included a chocolate torte that my son couldn't finish, but they provided a to-go box that allowed us to polish it off while waiting for the show to start, a key lime cheesecake that was far beyond what you would get out of a box or a Cheesecake Factory (save for the smaller portion), while I had the cheese board with a wide array of cheeses running from soft and gooey to firm and salty. It's a bit pricey, with a final bill for the three of us that was @$180 including the tip, but it was on par with other Disney Signature dining experiences we've had. Many people complain about the portions at this restaurant, and feel that it's not a very good value, especially when compared with the nearby Tusker House buffet, but for what Tiffins is trying to be, it fits the bill. I did appreciate having the appetizer and dessert included with the dining package, courses I would typically skip if dining al a carte, so perhaps the additional courses helped to offset the slightly smaller portions of the main dishes. Nonetheless, outside of EPCOT, this is easily the best set-down in-park restaurant in all of WDW, topping Cinderella's Royal Table, Be Our Guest, and The Brown Derby.